More from BBC Worldwide to bring you, this time two titles arriving in May on DVD. 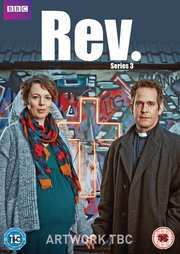 The first of these out on the 5th is Rev: Series 3, which stars Tom Hollander and Olivia Colman, and will carry a recommended retail price of £20.42. The third series asks big questions of the Reverend Adam Smallbone as he and his wife Alex adjust to life as new parents in the inner city parish of St Saviour’s, Hackney. How will Adam cope with parenthood on top of his small but demanding congregation? Can he manage being a father and a Father? The new series brings a host of new and returning characters to meet St Saviour’s band of lost but loveable misfits in six exciting new episodes that see Adam pushed to the limits of priestly endurance. Can he continue to fight the good fight against indifference, the worst aspects of his institution and his own tendency towards temptation? And as his huge rather empty church continues to crumble around him, can Adam win the battle to keep it open with a tiny congregation and paltry collection plate? Out on 12th May is The Trip: Series 2 which features Steve Coogan and Rob Brydon play skewed versions of themselves. Retailing for £20.42, there will also be a box set containing both series priced at £30.63. The Trip to Italy will this time see them spend most of their time arguing and competing to do the best celebrity impersonations while reviewing restaurants in Piemonte, Liguria, Tuscany, Rome, Amalfi and Capri.